In the year 2000 I retired from full time working, and spent a year seeking ‘sanctuary’ from a life so busy that it had overwhelmed me. Being too exhausted to go anywhere, my sanctuary had to come to me, so my wonderful husband built me a summerhouse at the end of the garden where I could find some healing peace. Knowing that the Domain in Lourdes had been one of the most inspirational places in my life, and thinking (wrongly) that I might never get an opportunity to go there again, I decided to reflect its importance in my summerhouse. 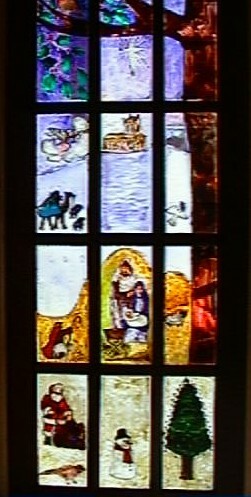 Each door would have a depiction of the grotto and of water included, as well as images that I love. This was my sacred space, my sanctuary, my still point, my little bit of heaven and I loved it. In my summerhouse I looked deep inside my self; I wrote (and then shredded) my life story; I restored my spirit; I emerged a different person. 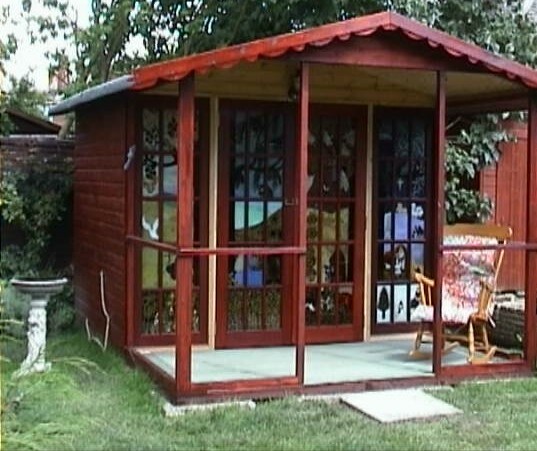 Sadly, I had to move home some years ago, and I could not take my summerhouse with me. But I have the photographs and I just have to think of it to find a beautiful stillness. This entry was posted in Cotswolds, Creativity, Photography, Spirituality and tagged Weekly Photo Challenge. Bookmark the permalink. this looks so amazing! !… loved reading the story behind. Oh Brenda, what an absolutely beautiful tale about your summerhouse. I was very moved reading this. 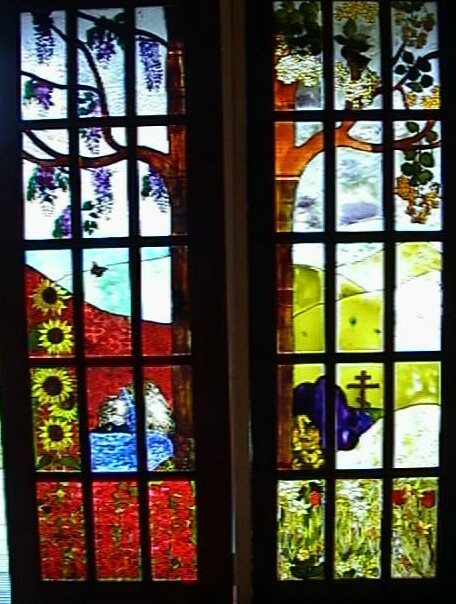 I adore your ‘stained glass’ windows, what an amazing idea! This makes my summerhouse look so plain in comparison, I wish I could do something like this! I know just what you mean about it being your sanctuary. As you know, I write from mine. I wonder if I will emerge a different person? Thanks Sherri x I know the family who bought our old house and they use the sanctuary as an office x they have promised me that if they ever knock down the summer house they will give me back the doors! We had to move to a bungalow when my husband became ill as the stairs and garden were too much for him. One day I may have another sanctuary- I certainly still need it!